No matter the origin of food, it's a great conversation piece. The restaurant staff of Victorino's in Quezon City went around with a tray of appetizers on hand. They offered Melba Toast - a thin slice of brown bread topped with a pate that I could not identify. I took a bite, reached for the menu and discovered it was made from a root crop. This was followed by a serving of Creamy Sweet Kamote Soup, which I mistook as pumpkin soup. The night got more interesting with the buffet spread offering Kamote tops with Bagoong in Vinaigrette dressing as salad, Bagnet chips, plain and Kinirog rice, Pakbet ala Apo Lakay, Lumpiang Kamote at Hipon, Roast beef with Kamotato and desserts like Kinalti with Panutsa sauce and Patopat with mango balls. This kamote-Ilocano themed dinner was prepared by Chef Heny Sison, inspired by the recipes of Ms. Jean Savellano (who is the mother of the owner of Victorino's). 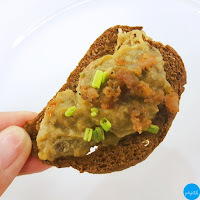 It highlighted root crops as a delicious and nutritious alternative. For someone who rarely eats kamote, I enjoyed this meal very much! Root crops are abundant in the Philippines yet it's not a staple in daily meals for most people. Ilocanos love their vegetables and feel weak without it. Kamote, in particular, is a resilient crop that is easy to grow and a good source of essential vitamins and minerals. Meat dishes we love like bagnet are said to be served during special occasions only. That's just a glimpse of a food story from Ilocos Sur. What's yours? 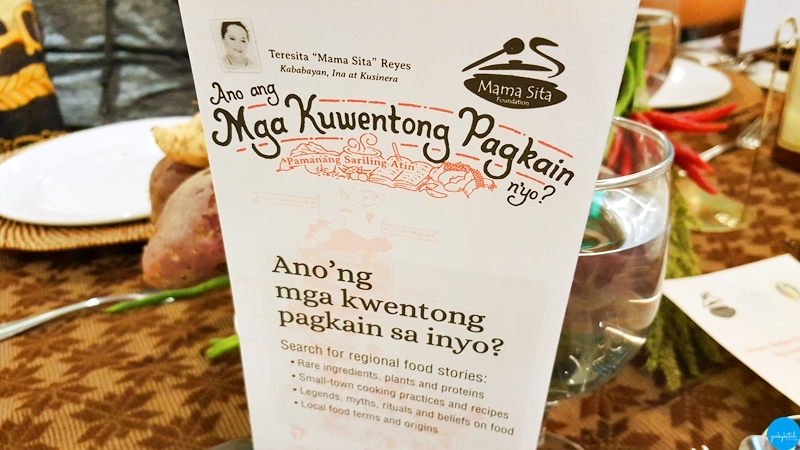 Share your authentic, one-of-a-kind Philippine culinary stories to Mama Sita's Mga Kuwentong Pagkain! Talk about a special dish or rare ingredient's origin and how it is made and enjoyed with an essay, poem, artwork or video.Fill up the entry form, available at Mga Kuwentong Pagkain Facebook page or Mama Sita Foundation website. Submit your story & form via email (mgakuwentongpagkain@msita.com or mgakuwentongpagkain@gmail.com) or mail it in a short brown envelope addressed to Kusina ni Mama Sita (131 F. Manalo St. San Juan, Metro Manila, Philippines 1500). Entries will be judged according to content (50% - how relevant is the entry to Philippine cuisine? ), presentation (30% - how true is the entry to that region's local culinary culture?) and originality (20% - how creative is the entry?). The winners will receive P20,000 cash prize, a culinary tour in Luzon, medal, special gift items, accommodation and round trip air tickets for the awarding! Deadline of submission is on January 26, 2018. Winners will be notified through their contact details and announced at the Mga Kuwentong Pagkain Facebook page, Mama Sita website and through the media. 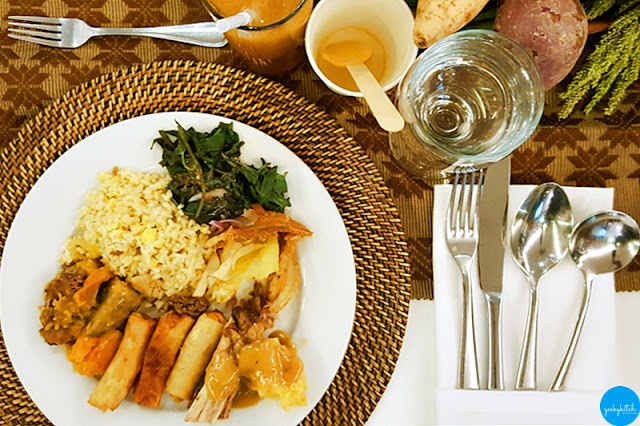 "Ilocano Recipes for a Warmer Planet: Ilocano Inspirations" was the project of this year's batch for Introduction to Cultural Heritage under the Cultural Heritage Program of Ateneo de Manila University. They traveled north to Vigan to study Ilocano cuisine, arts and crafts. The event was supported by Mama Sita Foundation. Single Bells this Christmas? Keribels lang yan!